John and Thomas Moore were the first Covenanters to come to this area in March 1820 and others soon followed. Most had left South Carolina because of their anti-slavery views and chose to settle in Indiana because the state did not allow slavery. The Reformed Presbyterian Church of Bloomington, Indiana was organized on October 10, 1821. The first meeting place was a log house at 406 West 10th Street which was known as the Blair Farm. The church was reorganized in 1823, and again in 1833. In 1836, a brick church building was erected two miles southeast of town on land now adjacent to the church cemetery at the corner of High Street and Moores Pike. At that time, the church was called “Bethesda Church and Congregation”. Eleven years later on the Sabbath morning of April 18, 1847, the building burned just before the time services were to begin. The decision was made to rebuild immediately. During this time the congregation worshipped together on the Lord’s Day while mid-week meetings, which were divided into five societies, were held in the homes of different members. The societies took turns clearing the burned building and soon a better one was built (for a total cost of $1,060.63 including interest). During the pastorate of D. J. Shaw in 1877, the decision to erect a new church building was made. The old building was torn away and the ground on which it stood was sold to Robert Anderson, a slave who was befriended by the Covenanters and given his freedom. This property is now owned by descendants of Mr. Anderson. 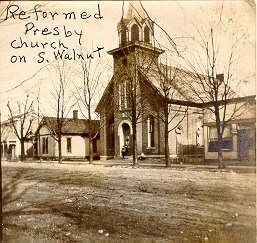 The Bethesda Congregation then moved from the country to a brick building in the 300 block of South Walnut Street and was designated as the “Bloomington Reformed Presbyterian Church”. this site on October 21, 1927. During the mid 1980’s, the congregation and its leadership undertook a revitalization program, beginning with the development of a new statement of purpose. In response to the congregation’s stated purpose to be committed to God, to others, and to growth, the position of associate pastor for outreach was established. God has been pleased to bless these efforts as the congregation has more than doubled in the last fifteen years. For over 185 years, the Bloomington congregation has strived to serve the Bloomington community. The congregation joyfully celebrated first, 150 years of service in the community, and later, 175 years. We lookforward to our bicentennial celebration as a congregation in 2021.